The Hanging Flume illustrates the ingenuity and fortitude of miners, intent on extracting gold from the land. 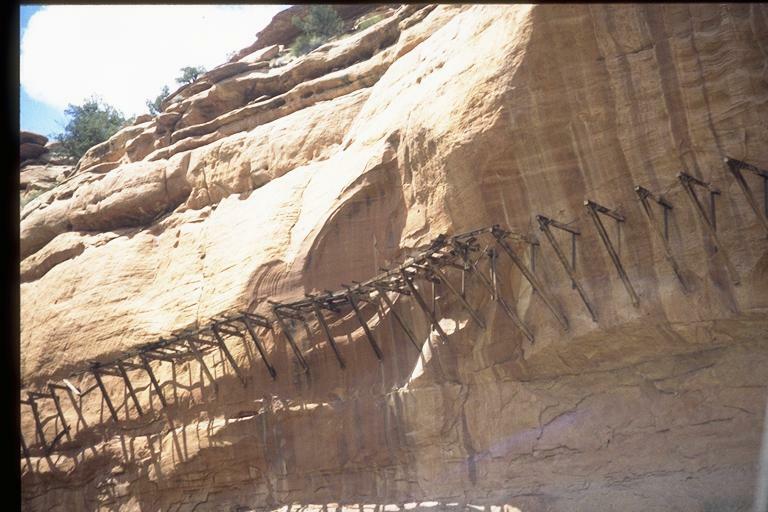 There are few remaining segments of hanging flumes throughout the western United States and as a result of this Save! it is the only segment preserved for public education and appreciation. The Hanging Flume is a relic of hydraulic mining, an engineered structure on an incline that conveyed water. Between 1889 and 1891 the flume was constructed with 1.8 million feet of lumber, hanging 100-150 feet above Dolores River and was used to convey eight million gallons of water per day to placer gold deposits. Due to the flume’s significance it was placed on the National Register of Historic Places. When first listed on the Endangered Places list, what remained of the chute was showing signs of extreme deterioration from natural weathering and roadside operations along Highway 141 above the canyon. Their precarious placement on the cliff made survey and condition assessment work difficult and costly. Colorado Preservation, Inc. worked with the Western Colorado Interpretive Association and contracted with Anthony & Associates, Inc. to complete a Historic Structure Assessment in 2003, after supporters secured a grant. The assessment highlighted various construction methods, rock continuation walls and numerous oxcart trails. 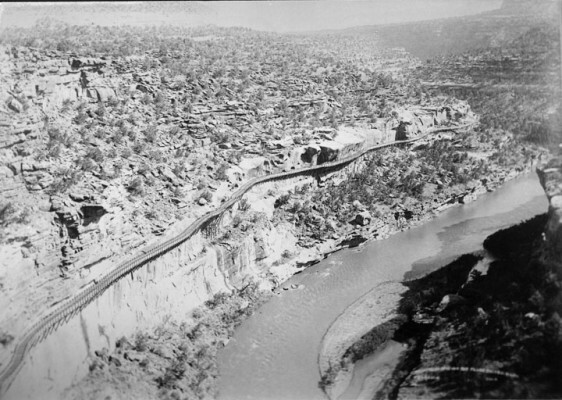 By 2004, the Western Colorado Interpretive Association acquired additional funding from the State Historical Fund, Bureau of Land Management, Bacon Foundation, the National Trust for Historic Preservation, John Henricks Family, and Gateway Construction and Design to document the history and condition of the flume. This phase also lead to the development of a master plan to preserve and interpret the flume that integrated the rive, trails and scenic byway. 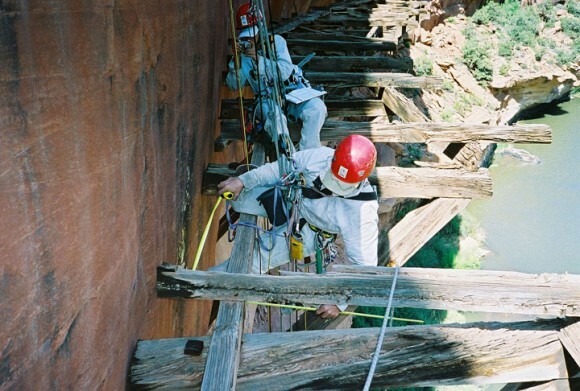 Vertical Access, professional climbers who ordinarily work on buildings for preservation assessments, rappelled down the canyon walls to help consultants analyze the site. The work was completed in 2005. The phase of work which included development and implementation of an interpretive plan and production of construction documents for reproducing a small segment of the flume was completed in 2012. Supporters are currently seeking funds for additional documentation of unexplored segments of the flume as well as construction of a larger segment of the flume on the rock face. The Hanging Flume was chosen from 234 nominations to make the 2006 World Monuments Watch list. This listing opened the possibility of broader exposure and funding sources, which lead to the site being saved. Donate to Restore the Flume!